I have been researching my family tree on Ancestry.com and love finding those tiny leaves on my tree (hints). A few are not my family, and I ignore, but the majority, by far, are all family hints -- documents from birth to death, photos, links to other family trees where more connections have already been made! FUN FUN! This is about my husband's family tree. We've known that the family name, Fisher, used to be Rybak long ago. Ryba = Fish in Polish and thus Rybak was changed to an Americanized version of the name, Fisher. As I started to dive into his research, I found family a few generations ago, where some took the new version of Fisher, and others kept Rybak. Now and then I do a Google Search when I feel stuck. Sometimes something interesting pops up! At one point, I googled "Rybak in Michigan" and up pops -- Rybak's Ice Cream Store in Port Austin, Michigan. Oddly enough, many of Terry's ancestors lived in Port Austin while working at the Quarry in Grindstone City, Michigan. Hmmm, too good to be true? Probably! So weeks ago, we took a day trip up one side of Michigan's thumb and down the other side. I wanted to see the coast a bit, as we are looking at cottages on the water. We really didn't consider looking for his family as it's too hard to find them many many years later, right? On the drive, Terry remembers Rybak's Ice Cream Store... and we find it on the map. Once Again, oddly enough, we are quite close to it. Off we go in search of it, and we FIND IT. I take photos of the outside with RYBAK on it... love simply seeing the ancestral name on something! Woot! We go inside and Terry yells out "Any Rybak's here?" The guy behind the counter says, "We are Fishers now." Terry replies "I'm a Fisher too!" Bottom Line: Terry's great grandfather and the shop owners great grandfather were brothers! They pulled out a few family documents from under the counter and I took photos to add to the story. 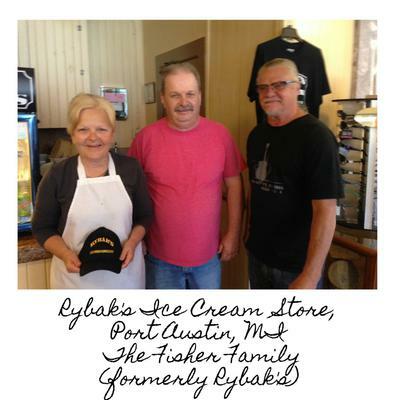 Terry bought a t-shirt that says "Rybak's Ice Cream store" on it... and loves having that name on it! Now, that's what I call a neat story and find long lost kin folk. It's something I wish for in my quest to find family that I never knew. So cool. I worked on our heritage many years ago but a little thing like life sort of side-tracked my search. We hope to get back to it in the near future. Thanks for sharing. Thank you for sharing; that was a fun story! I’ve been researching Ancestry.com for years and have met (online) cousins from England, Scotland, Australia, Canada, and several states nearer to home. It is such fun to follow new families! With your Canada, Scotland ties, I am anxious to learn if we are related! That would be a hoot! 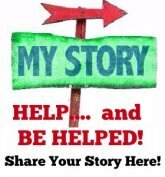 Wendy: I am writing to several DNA matches on my side right now... two cousins from Canada, one gal born in India and living in England, and another in England. We KNOW we are sharing DNA -- just working on where in the tree we are connected! Having a ball with Ancestry! Cooper (grandfather) - Frazer (grandmother) - then other generations are: Muise and Kensett. Anything familiar? Wendy - What a delightful surprise for you and your husband! Adding branches to the family tree is an interesting hobby and fun too! WOW! Great you did the research on your family! Pt Austin, MI? That was our favorite vacation spot as kids, we used to stay at Buffa's cottages. I wonder if Rybak's Ice Cream Store was there in 1967? If so, I'm sure we patronized the store! Best Wishes for a great retirement and time with your newly found family! Wendy: They opened the store eight years ago... the building is very very old. Can't beleive you KNOW Port Austin, MI! A search for ice cream yields...Family History! I love this story, Wendy! Did you take photos? Now that you've written a blog post, an easy way to turn it into a video is using Lumen5[dot]com. You can upload your own photos to it. I love that the ice cream store owners had the documents on hand!! So cool. Was the ice cream yummy? Hi Ken in San Diego! I'd like to invite you to join Wendy's online friendship community.